Flower's House, 15 Hendford situated between Ayr House and the Butchers Arms, was built around 1820 and was the home and surgery of Doctor George Flower in the early 20th century. 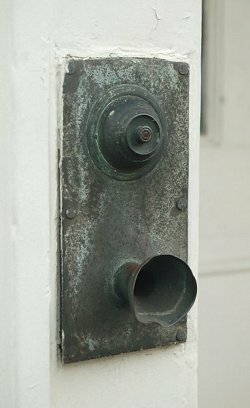 It still retains the doctor's night bell and speaking tube by the front door, shown at left. 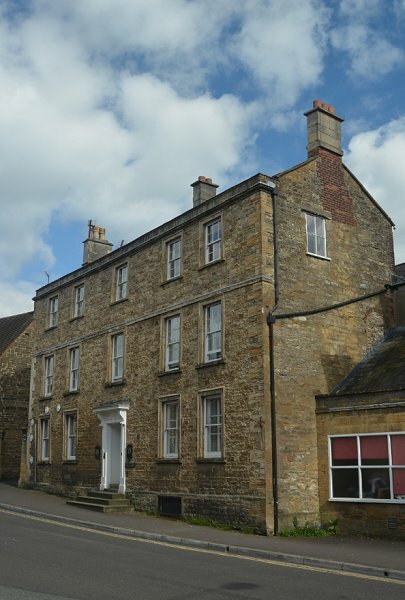 Town House (now offices) of probably late C18. Local stone cut and squared and ashlar dressings, with Welsh slate roof between coped gables, having two end and one off-centre stone chimney stacks. 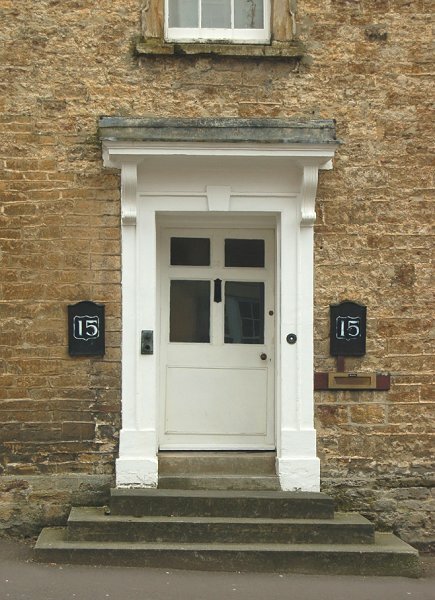 3-storey facade of 5-bays, with central doorway (three steps up) 5-panel door (the upper four glazed) in painted stone surround, with shallow cornice mould hood supported by plainish console brackets. Simple architraves to sashes at each level: ground floor windows have lost their glazing bars: first and second floors have 12-pane windows. Stone plinth (with modern cellar window to right-hand of doorway); stone band at second floor level; simple cornice at top with low parapet wall over. Centre window first floor has lugged and heeled architrave. Interior not seen. To left-hand of house 2-capped stone gate piers flanking side entrance. During the late 1830s and early 1840s the house was the property of Samuel and Mary Bradley and Watts' map of 1831 notes that it is the property of Dr Bradley. In the 1841 census both listed their occupations as of independent means. Samuel Bradley died in the spring of 1842 and in the 1846 Tithe Apportionment Mary Bradley was listed as both owner and occupier of the house listed as 'House & Garden' (Parcel 370). The Apportionment also noted that the area of the parcel was 0a 2r 6p (for details on historic land measurement - ie acres, roods and perches - click here). Mary Bradley died in the spring of 1847. During the latter part of the nineteenth century it housed twenty boarders of the Yeovil Free School (located at the Chantry) and later became the Grammar School run by Henry Monk (see advertisement from Whitby's Almanack Advertiser of 1895 below). According to Brooke they seemed to have been well treated with four meals a day (meat twice) and separate beds. There was a playground (25 yards by 27), gymnasium and even a sports field for cricket and football. Monk was a good all-round cricketer himself and played in the first match of the Yeovil and County Cricket Club in August 1865. 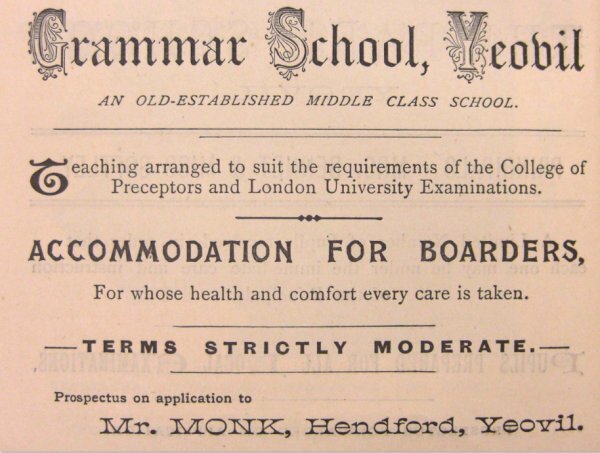 Monk provided a good schooling at an annual cost of about £30 including board. 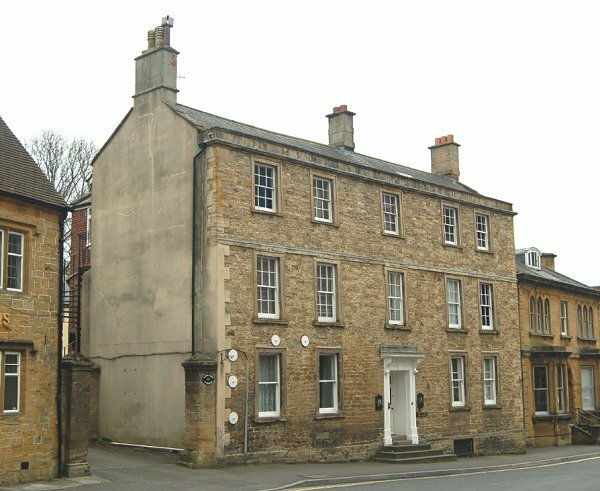 In the 1881 census 48-year-old Henry Monk, listed as a schoolmaster, was living in Flowers House with his wife Elizabeth and their seven children, together with a housemaid, nurse made and 10 boarders all males aged between 9 and 15. The property was put up to be sold by auction in July 1897 and the sale details give a good indication of the property as follows ".... Consisting of a spacious Dwellinghouse, with a good sized Greenhouse, Schoolroom, with Playground beneath, Lavatory and Workshop, and other Outbuildings, with a large Yard, well laid out in Lawn, and walled-in Garden. 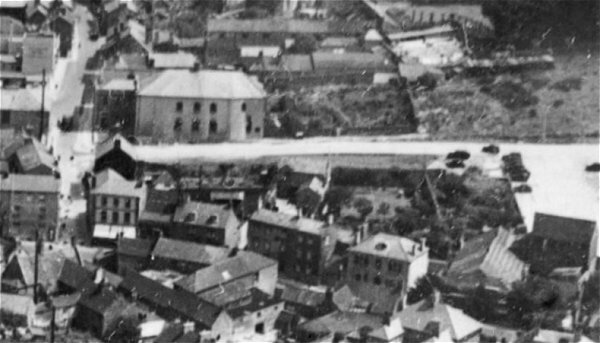 The Dwellinghouse has a frontage to Hendford of about 65 feet, and the premises are about 170 feet in depth, including a side entrance; having on the ground floor Entrance Hall, Staircase, Drawing Room, Dining Room, and general Sitting Room, Kitchen and Scullery, with a good Cellar underneath; on the first floor three front Bedrooms, large back Bedroom, Servant's Room, Box-room, Landing, and WC; and on the second floor Landing, four Bedrooms in front and one at back. The Schoolroom and Playground underneath are readily convertible at a nominal cost into a commodious coach-house with lofts or storerooms over, the lavatory and workshop into a two stalled stable, and the outbuildings into a detached Cottage and Offices. The whole property is in substantial repair and condition, and is highly suitable for a professional gentleman or a family residence." 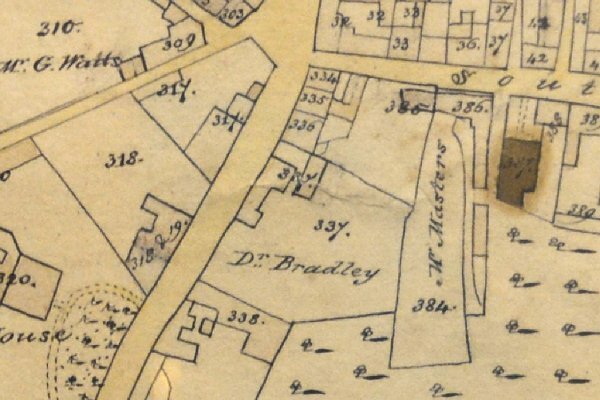 A section of E Watts' map of 1831 showing Parcel 337 at centre (today's Flower's House), denoted as the property of Dr Bradley. 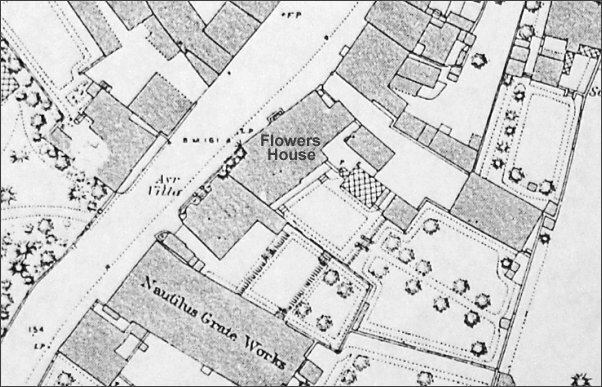 The 1886 Ordnance Survey showing Flower's House at centre with its extensive gardens behind. 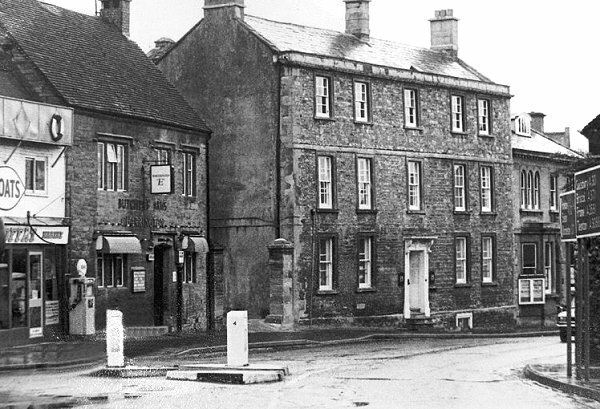 Flower's House photographed about 1970, before Moffat Marine was demolished for road widening. Flower's House, Hendford, photographed 2013. The fine entrance to Flower's House, photographed 2013. Photographed for my book in 2017.